Great AR experiences, like seeing Nike trainers via Facebook Messenger, will become more widespread over the next coming year. Nike are using the latest technologies to add value to their brand and engage from enticing new customers and their most obsessed fans. Located at their Flagship store in Paris, Nike has unveiled ‘NIKE ID’ an AR experience that projects custom designs onto sneakers and makes them viewable to shoppers in real-time. 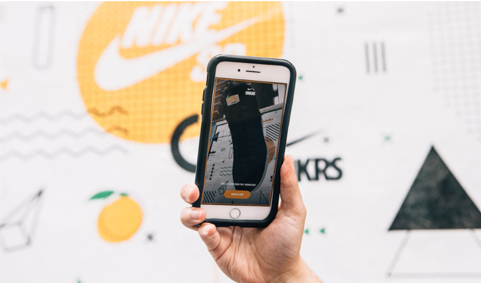 Nike has also been among the first companies to roll out an app, giving customers the chance to shop limited-edition sneakers and see the shoes up close and personal using AR. To snag the initial pair, the Kyrie 4 “Red Carpet” edition, fans of the brand had to link their SNKRS account to Facebook Messenger, enter a code of emojis and unlock the shoe, which was displayed on a red and gold platform and could be moved or manipulated by the user, as well as shared with his or her friends to get a second opinion. Nike is also getting into augmented reality to push shoe sales and you’ll need an iPhone to get in on the action. The sport and athletic footwear company has teamed up with Momofuku & the SNKRS app so customers can be among the first to buy its latest shoe designs by pointing their iPhones at special posters on city walls.